One of the questions I seem to get asked most about Georgia's outfits are where I get her bows. We are total bow addicts and she wears one every day. I'm taking advantage of it now while she's young and doesn't notice them yet. Although we have a ton of different brands and styles, all that we love, we do have some favorites that have proved to be good quality, the best colors, the best fit, or ones we just seem to use the most. Best Bow Subscription - Little Poppy Co - we love these bows! They fit amazing and the quality of the bow is seriously on point. They lay nice and flat and always come in festive and fun colors & different styles. This is our only bow subscription that we have at this time. It's $11.99 a month plus shipping so we pay $15.49 a month for 3 bows that come in the mail. I love the convenience of a bow subscription because you know you're getting 3 new bows. The down side is you don't get to choose your bows, however, I've been happy with every single month so far. 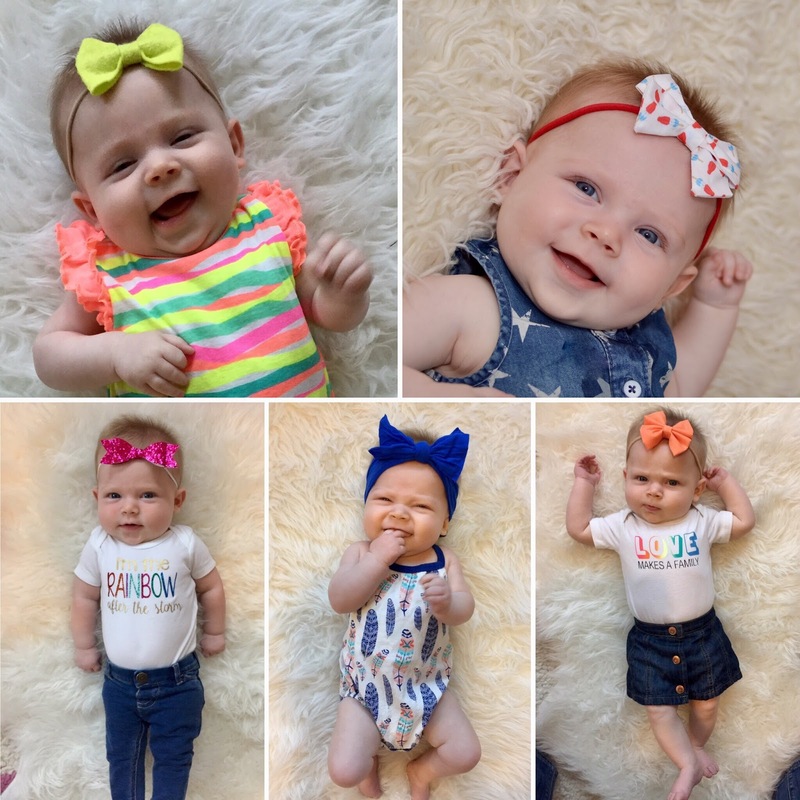 Best "good cause" Bow shop - Raising Little Ridley's - these bows are near and dear to my heart because they are made to support a great cause - funding IVF for the owner of the shop! Tina does an amazing job with her bows and one of my all time favorites in Georgia's collection is the bomb pop bow. I'm also a little biased towards this shop because we just happen to share the same last name! Most Used Bows - Lilly Belle Market - we get tons of compliments on these fun bows, the set we bought in particular is called the Mermaid Tail Bow Set which is currently sold out, however this shop is LOADED with bows, seriously so many choices! I happened to buy these when I ran across them on a sale and was so happy with the quality of the bow. We get a ton of use out of these. I'd say these are probably our most worn bows next to the Little Poppy Co bows. The bands are a little different, they come on a white elastic band rather than a nylon band. Best Head Wrap Bow - Baby Bling Bows - I absolutely adore these bows. They're so versatile size wise because they fit baby all the way up to adult. They're so stretch and they come in the best colors! I am totally obsessed with the royal blue one and the cactus print one that Georgia hasn't had a chance to wear yet. Right now the only downside with these bows is the ALWAYS end up over her eyes, we then just refer to them as sleep masks rather than bows. So when she does wear these I try to make it for shorter periods of time. Most Sentimental Bow - The Itsy Bitsy Bow Co - honestly this peach colored bow is the only bow I own from this shop but it is one of my favorites! I love the peachy/orange sherbert color and I love the wide style of this bow. Georgia has been rocking this bow since she was just a few weeks old and luckily it still fits her, despite her head size putting her in the 92nd percentile it still fits her well & it still looks adorable on her. This is one of the first bows I bought for her just a few weeks before she was born and I had to have it because of the color. I believe I bought the very last one she had in the shop too. This is just one special bow.